My First Float Tank Experience! First off, let me show you the room of said float tank! This is the float tank. It was soooo much bigger than I thought it was; Pretty close to the size of my little Nissan! The inside of this pod was also much bigger than I thought it would be. I do have slight problems with claustrophobia, but actually seeing the size of the inside really helped easy my worries. There was also this cute little cart that had all kinds of things you might need for the float tank, and after you leave! When I first got into the tank, I was taken by surprise of how easily I floated! I do not have that much body fat and have never floated well; but this was aweeesommee! I floated around for a bit and watched the colors of the light change and listed to the calming music, and then, the music stopped, the lights turned off and it was quiet. At first it really freaked me out with how quiet it was and how pitch black it was too. 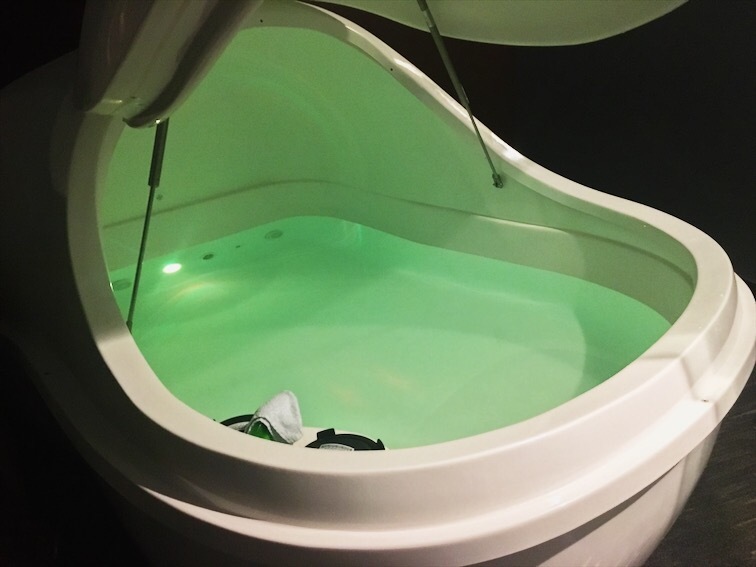 People weren't kidding that it's a deprivation tank. After a few minutes of getting my muscles to relax, I felt a lot better. I was tired before I went to my appointment, and I could not decipher whether I was wide awake or having a really crazy dream. My ears were under the water most of the time, and I could most definitely hear my heart beating. At one point I saw a one-eyed man with a hook for a hand reaching down at me like I was a fish. I swear I watched all of "Howl's Moving Castle." And, my body would jolt like I was dreaming and my whole body would twitch and I would "wake up" even though I thought I was already awake.... it was so strange. Before I knew it, the music was starting again and the lights slowly turned on. When I sat up, I felt suuuuper heavy and sore? I stretched for a little bit and after 3 minutes or so, I got out of the pod. I rinsed of in the shower, as well as wash my hair and body and got dressed. The calming music was so nice while I was gathering my things before I left. I felt so relaxed!!! I felt refreshed and energized and at peace with myself and it was fantastic. The man at the front desk had an ice cold water for me and even offered me half off my next float!!! For someone who was a first time floater, the experience was so weird, but so worth it! I am very glad I was able to do this on my week of 'Staycation' from my full-time job. If you ever get the chance to try out a Float Tank/Pod, I would totally recommend it! 10/10 would recommend. This is all for now my loves!